We have always had a variety of time capsule customers. Each of them has a certain reason for placing their time capsule. Each has a particular vision for their special gift to the future. And, over 95% of these customers have never done a time capsule before. Sometimes they ask us for advice. Every now and then they follow it. Yes, we have been in the time capsule business over 25 years. We have seen our share of complicated time capsule projects. Indeed, some such potential customers went elsewhere. One such person in San Diego wanted to have his time capsule sitting in water for 50 years. They did not like it when we told him, "Don't do that." Others do become our customers, and we want the best for them. But they often have unrealistic expectations of the kindness of materials and conditions. Some materials are not intended to last. And most conditions are more likely to be harsh than kind. In general, container makers use materials that suit the purpose, and nothing more. It's common for most people to think plastic makes a good time capsule material. Why? Because they think plastics will last forever. They hear that our planet is doomed because of that. So they think a plastic time capsule will also last. They think it’ll protect precious contents. Not so. You may have plastic in 50 years when you open that time capsule. But it’s a crap shoot whether you will have your contents in fair condition, too. Remember the Millennium? We were in the time capsule business then. One of the most interesting projects we had was for the New York Times in 1999. They called it the Millennium Times Capsule. In 1999, a committee at the New York Times Magazine held a competition for building it. They chose 48 designers, architects & engineers and asked them how they would build the time capsule. The goal? To preserve artifacts for the next 1,000 years. And to have it look good. They also reached out to their readers to get ideas for time capsule contents. The Spanish architect Santiago Calatrava won the design competition. He said he got the idea for the winning sculpture design from thinking about a fruit. "I was thinking how people would react when they found it," he said. "When you see an apple for the first time, you know there's something inside. It is something to be found, to be discovered." Calatrava's design was beautiful and also practical in the space it provided for artifacts. The stainless steel sculpture stands 5 feet high, weighs 4,000 lbs. 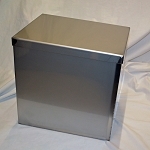 It holds 4 of our 12x12x16” stainless steel time capsules inside (called sub-containers). Hundreds of time capsule items are inside those smaller capsules. The main challenge was environmental. Over time, the contents in the time capsule would heat up during the day and then cool off at night. 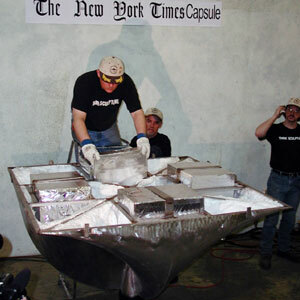 Each day of the NYC summer for the next 1,000 years, the items in the time capsules would bake. Over time the papers would get brittle. The plastics would soften and melt. It would not matter that the sculpted oven outside of the American Museum of Natural History was so beautiful. We removed the oxygen from the air in the smaller capsules before we welded them closed. But that does not provide insulation, and the sculpture had little room for it. Something new at the time called Nano Insulation saved the day. Nano insulation panels formed a much thinner wall than the housing insulation we are all familiar with. Our first step was to line each of the 4 12x12x16" time capsules with the special insulation panels. Then we placed time capsule items in the boxes. We conditioned the air and slipped another panel on top. Welding the boxes closed was tricky. The heat of the welds could damage the panels. We then shipped the 4 boxes to A.R.T. Research Enterprises. They fabricated the sculpture and they also inserted the smaller capsules inside. They placed more insulation panels between the outside of our capsules and the main capsule’s outer wall. 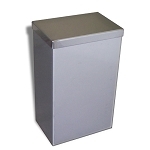 We currently sell a similar Capped Time Capsule in the 12x12x20" size and a similar Bolted Time Capsule in the 12x12x16" size. 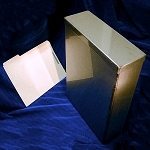 Do You Need to Insulate Your Time Capsule? Cornerstones. Not all cornerstone placement conditions are insulated. It’s common to see workers remove time capsules from the outside of a building. Workers remove the plaque and the box is just sitting there. They are lucky if the box has not leaked. But the contents will be brittle. How long have they been in and out of the ‘oven’ of the sun’s rays? In the ground. Make sure the time capsule is not placed close to the sidewalk. If it is, you will not have enough room for insulation. We recommend 18 inches or more between the top of your time capsule and the sidewalk area. Special enclosure. You’ve planned to build a special area above ground to house your time capsule. But did you plan to allow plenty of space for insulation, too? You can still build the enclosure - just make it big enough to hold insulation. Always use common sense when placing a time capsule. Be grateful your conditions are not as severe as the NY Millennium Times Capsule! But the conditions that you do provide for your own time capsule are important. Don’t over-think it. But do provide for the things you can foresee, such as weather.